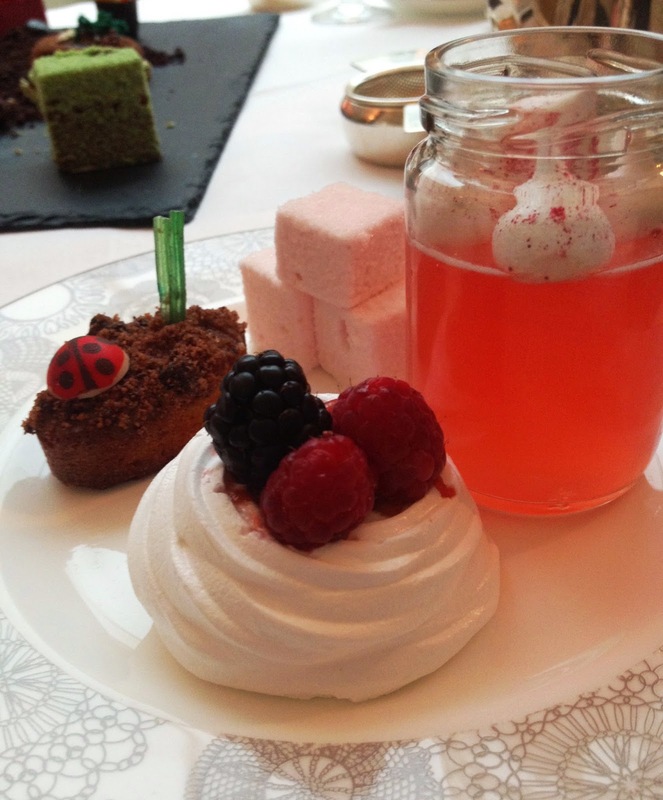 Yesterday afternoon I enjoyed an Afternoon Tea that would delight Champagne lovers, Gardening fans and those with a sweet tooth, so pretty much everyone! 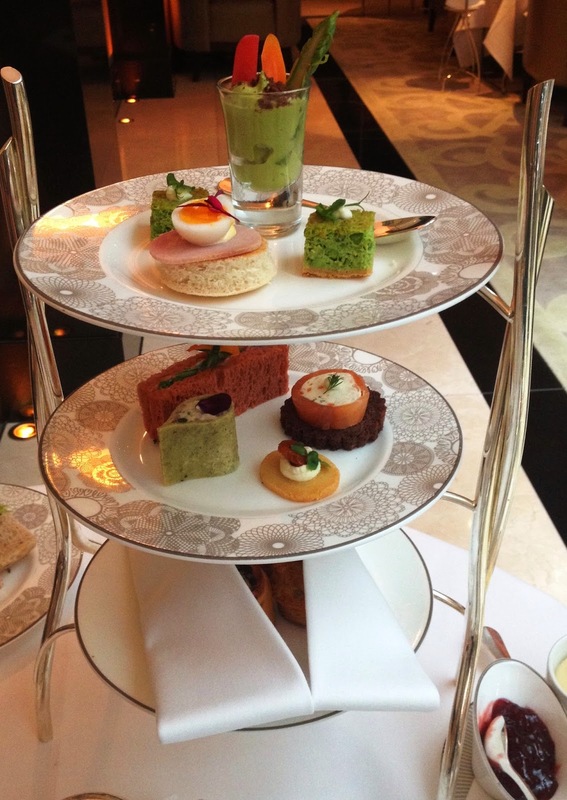 Not only did it tickle the taste buds but this Afternoon Tea was a stunning visual treat as well. 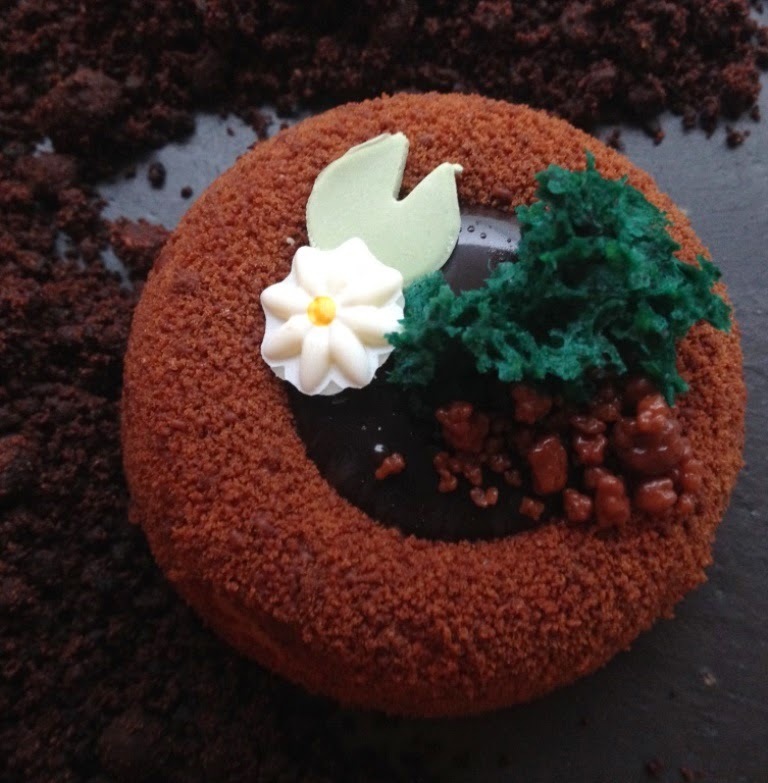 To celebrate this year's RHS Chelsea Flower Show, The InterContinental London Westminster Hotel has partnered with Laurent-Perrier to create an exquisite floral Afternoon Tea. Afternoon Tea was served in the Lounge, a beautiful and relaxed Art Deco inspired room, the chairs were comfortable and the ambiance was excellent with live background music from a Harpist. The colour scheme was mainly cream, black and white with the odd splash of colour from the furniture and gorgeous flower displays that had the most wonderful scent permeating throughout the room. The savoury selection was simply fantastic, the vegetable shot was an avocado mousse and pickled veg sprouting out. Very nice indeed. I also loved the fact that this selection wasn't simply sandwiches. A man came out later with a tray of the selection so you could replenish with your favourites. I loved it all but chose to have more of the eggs Benedict. My husband when asked if he had any dietary requirements asked it it was possible to have a dairy free selection, this was no problem at all and he was brought his own selection of sandwiches, he was delighted with the houmous, red pepper and spinach offered. 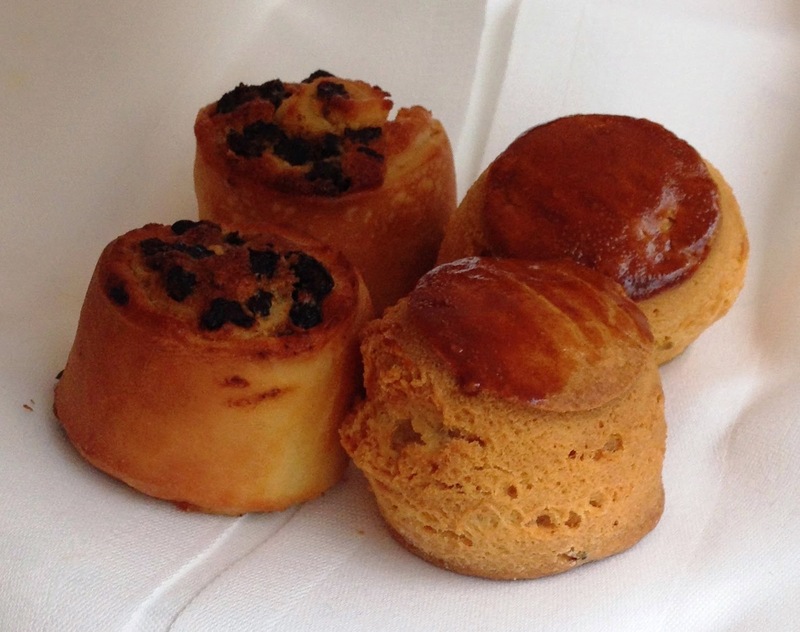 Ooh these were a real treat, the mini Chelsea Buns were warm, moist and packed with raisins. The pastry literally melted in the mouth. As recommended by our server I ate these with the lemon curd which was gorgeously sweet but perfectly tart. I wasn't sure what I was going to make of the Lavender infused scones but they were a revelation, absolutely delicious and light, with the delicate taste of Lavender. To accompany the Afternoon Tea I chose to select from the recommended floral tea selection pairing. I started with the Flowering Osmanthus - A base of green tea buds topped with orange lily petals and bursts of orange asmanthus blossoms. Beautifully sweet with notes of apricot and mango. I found this to be really delicate and not at all overpowering which was ideal for the savoury selection. 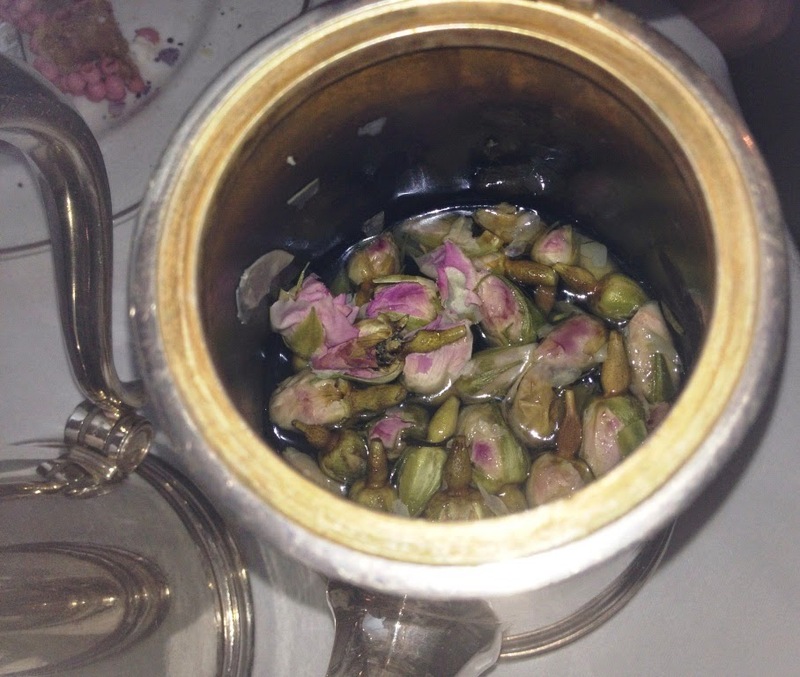 Half way through the Afternoon Tea I switched to the Whole Rose Buds Floral Tea - Beautiful and graceful notes of sweet-edged rose with a refreshingly light and palate-cleansing finish. 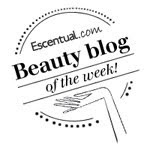 As readers of BeautySwot know, I am a huge fan of all things Rose and this hit the spot completely. Fragrant and light. One of the best teas I have ever tasted. I could have drunk this all day. My husband opted for the Vanilla Black Tea and was equally delighted with his choice, this had a gorgeous vanilla scent that wafted up around our table with an ever so light vanilla taste. He became a fan of vanilla tea instantly. Naturally this greenhouse was the showcase and highlight of the Afternoon Tea, once the lid was lifted everything was edible. A horticultural, floral showpiece. 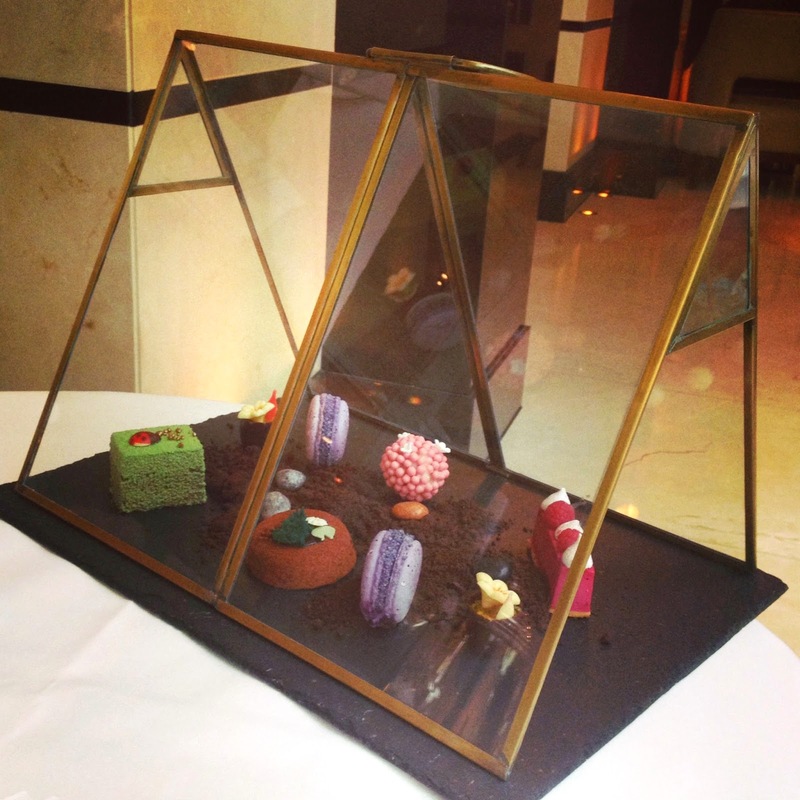 A masterpiece of art which was so pretty to look at whilst devouring the sweet and chocolate treats. The chocolate pebbles were edible and even the earth was chocolate and olive. Each mouthful was a triumph. I have to say the cakes were large enough to share and plentiful.. We were offered more sweet treats but I was more than satisfied with the amount on offer. Unfortunately, or fortunately depending on how you look at it I had to eat it all myself... as once again the Hotel came up trumps and delivered a dairy free plate of sweet treats for my husband. They even returned with some special jam macaroons for him too. 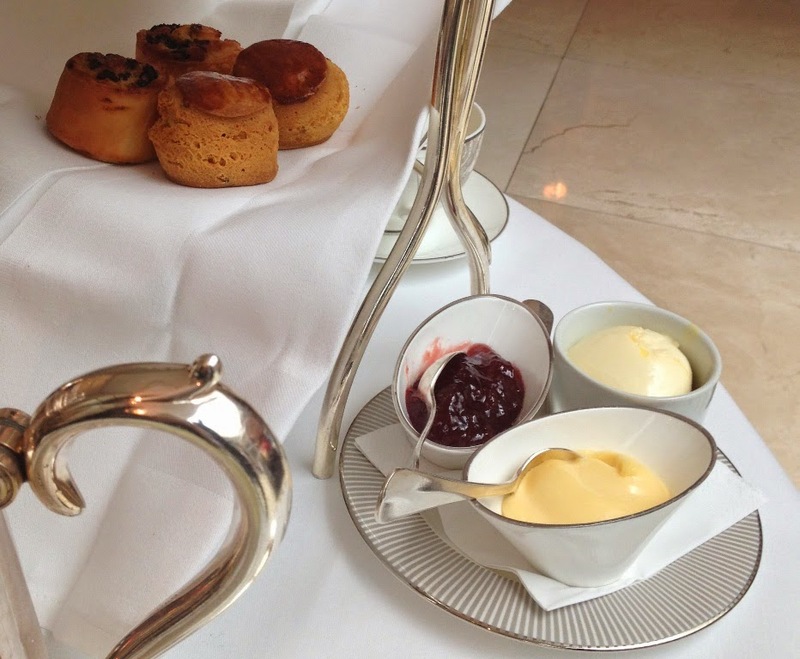 I have to hand it to the InterContinental in the way that they bent over backwards to accommodate and assist my husband's dairy free Afternoon Tea request. Although we asked at the time of arrival, I would always recommend that you enquire and request in advance before visiting so that the establishment can be prepared to cater for any dietary requirements. We experienced impeccable, friendly and attentive service from the moment we arrived to the moment we left. 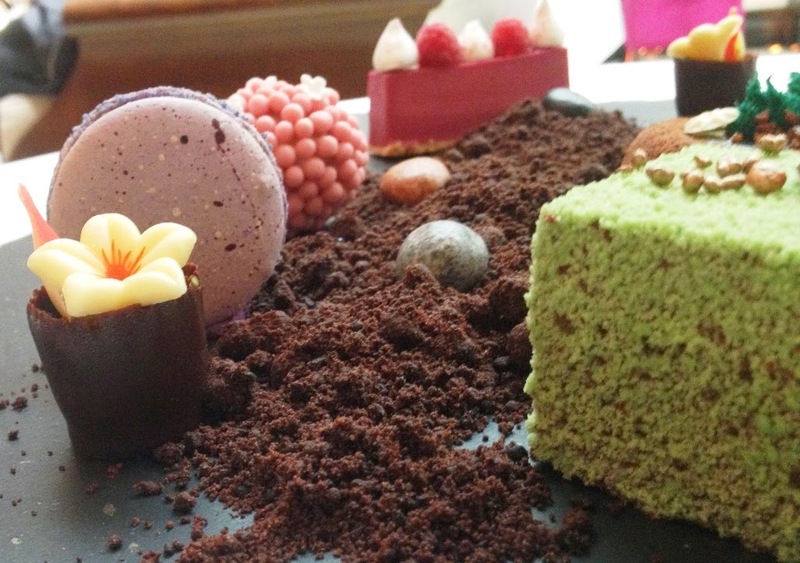 The Edible Garden Afternoon Tea was a visual and taste delight and an unusual, nice alternative to a traditional Afternoon Tea. 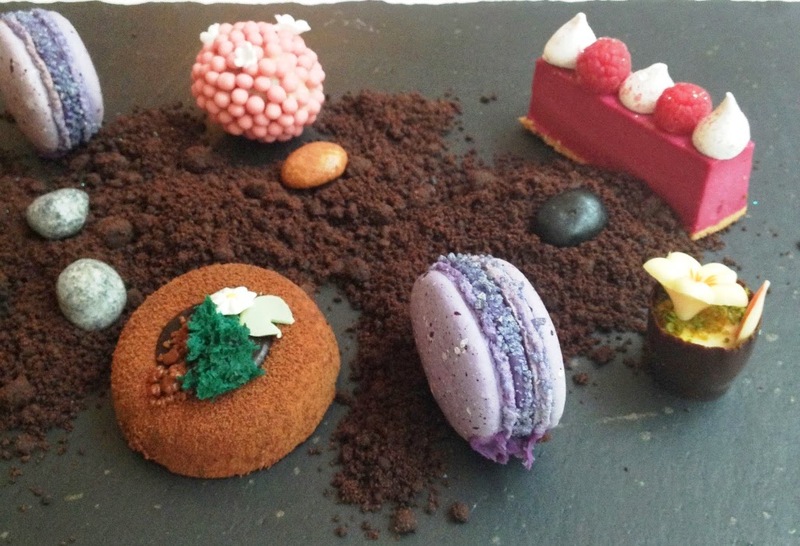 We particularly marvelled at the attention to detail in the savoury and sweet treats. 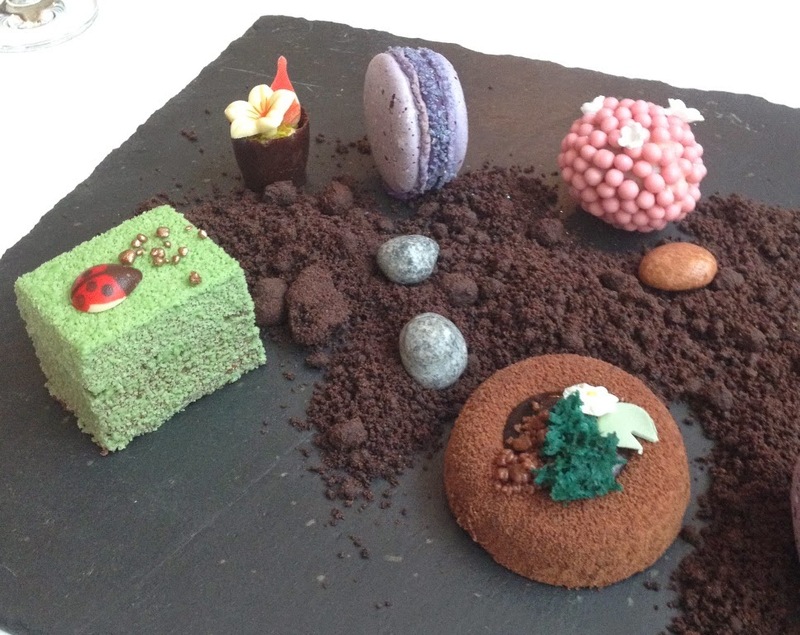 The little ladybird on the hedge, the chocolate pebbles, the white chocolate flowers and my favourite the edible earth! The pond was another huge hit. 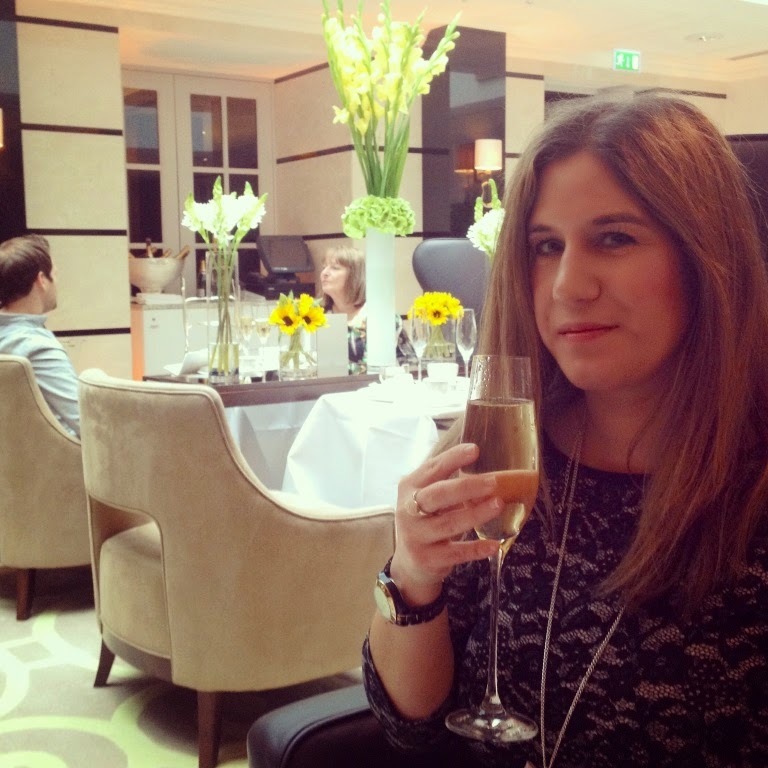 We loved every minute and particularly appreciated the free flowing Champagne that was constantly topped up! 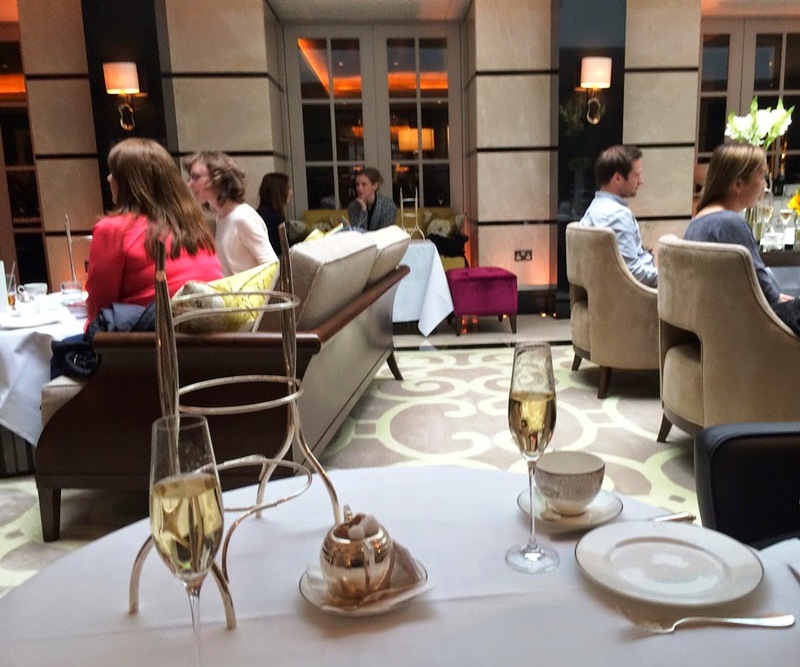 If you are looking for a fantastic and different Afternoon Tea in a relaxed and luxurious setting you will adore this. Book now and hurry as it is only on until the end of May! Looks amazing! 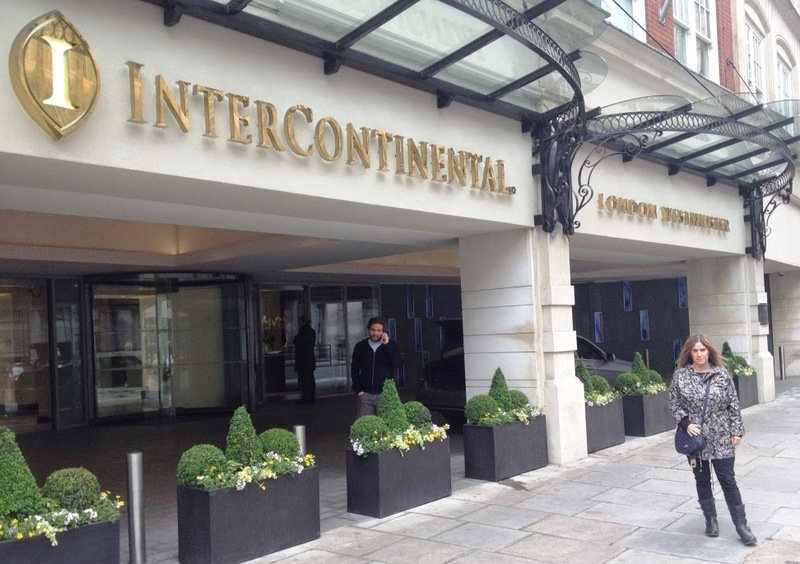 I went for tea at the Intercontinental last summer and it was perfect!